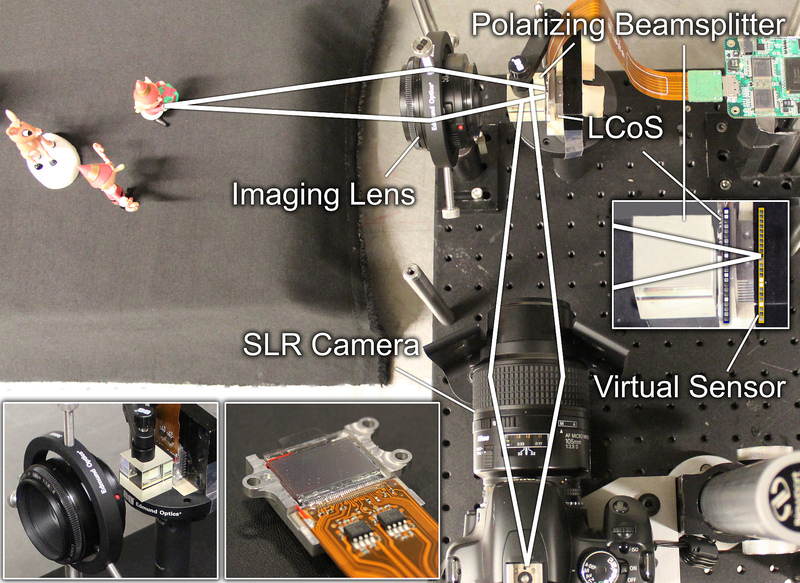 A frugal camera design exploiting the fundamental dictionary of light fields for single-shot capture of light fields at full sensor resolution. SIGGRAPH 2013. ACM Transactions on Graphics 32(4). Figure 1: Light field reconstruction from a single coded projection. We explore sparse reconstructions of 4D light fields from optimized 2D projections using light field atoms as the fundamental building blocks of natural light fields. This example shows a coded sensor image captured with our camera prototype (upper left), and the recovered 4D light field (lower left and center). 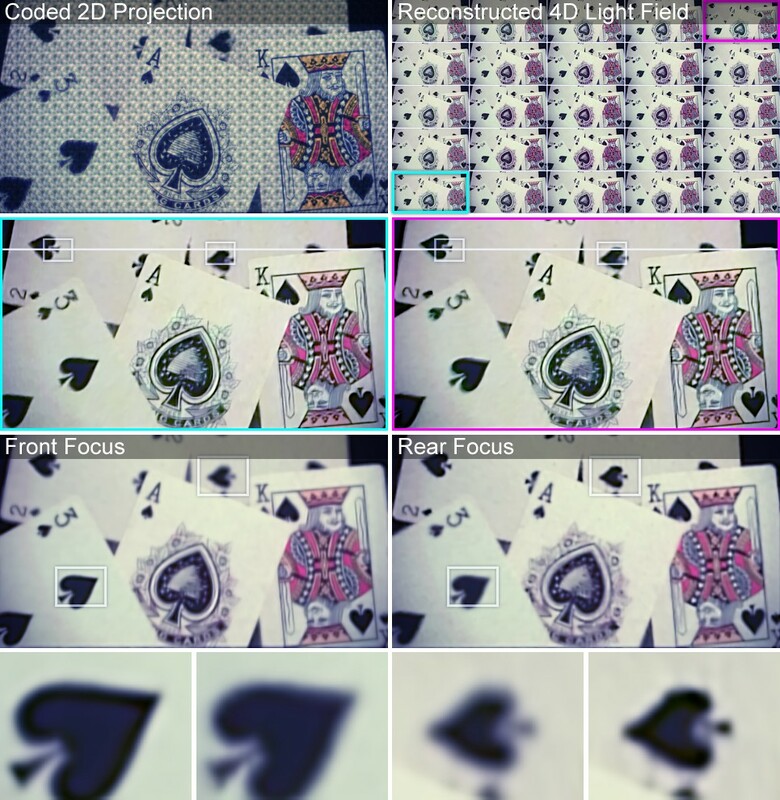 Parallax is successfully recovered (center insets) and allows for post-capture refocus (right). 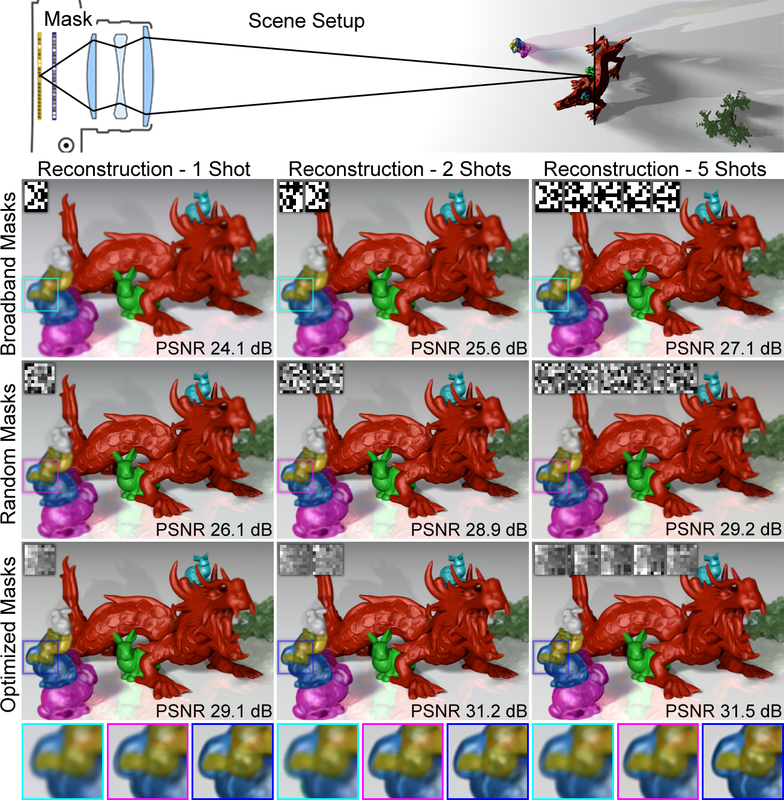 Even complex lighting effects, such as occlusion, specularity, and refraction, can be recovered, being exhibited by the background, dragon, and tiger, respectively. Light field photography has gained a significant research interest in the last two decades; today, commercial light field cameras are widely available. 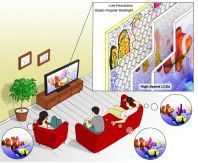 Nevertheless, most existing acquisition approaches either multiplex a low-resolution light field into a single 2D sensor image or require multiple photographs to be taken for acquiring a high-resolution light field. 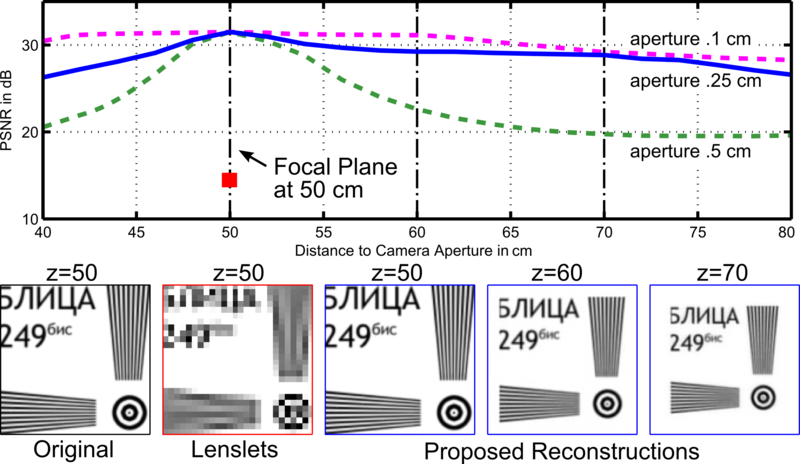 We propose a compressive light field camera architecture that allows for higher-resolution light fields to be recovered than previously possible from a single image. The proposed architecture comprises three key components: light field atoms as a sparse representation of natural light fields, an optical design that allows for capturing optimized 2D light field projections, and robust sparse reconstruction methods to recover a 4D light field from a single coded 2D projection. In addition, we demonstrate a variety of other applications for light field atoms and sparse coding techniques, including 4D light field compression and denoising. K. Marwah, G. Wetzstein, Y. Bando, R. Raskar. Compressive Light Field Photography using Overcomplete Dictionaries and Optimized Projections. Proc. 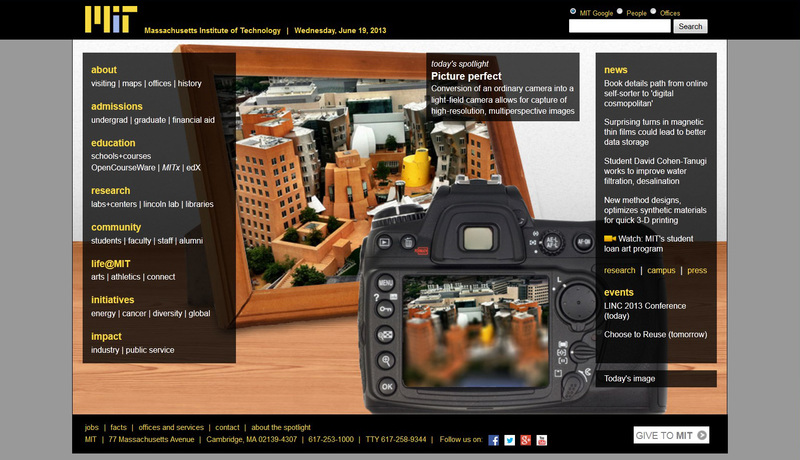 of SIGGRAPH 2013 (ACM Transactions on Graphics 32, 4), 2013. Convert DSLR Into a Light Field Camera from Kshitij Marwah on Vimeo. We thank the reviewers for valuable feedback and the following people for insightful discussions and support: Ashok Veeraraghavan, Rahul Budhiraja, Kaushik Mitra, Matthew O’Toole, Austin Lee, Sunny Jolly, Ivo Ihrke, Wolfgang Heidrich, Guillermo Sapiro, and Silicon Micro Display. Gordon Wetzstein was supported by an NSERC Postdoctoral Fellowship and the DARPA SCENICC program. Ramesh Raskar was supported by an Alfred P. Sloan Research Fellowship and a DARPA Young Faculty Award. We recognize the support of Samsung and NSF through grants 1116452 and 1218411.